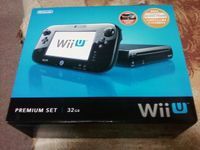 The Wii U is a video game console from Nintendo and the successor to the Wii. The system was released on November 18, 2012, in North America, November 30, 2012 in Europe and Australia and December 8, 2012 in Japan. It is the first entry in the eighth generation of video game home consoles. The Wii U is the first Nintendo console to support high-definition graphics, capable of producing video output up to 1080p, and has 2 GB of RAM with half dedicated to the console's operating system. The console was released in two versions: a "Basic" white-colored version with 8 GB of internal Flash storage; and a "Deluxe"/"Premium" black-colored version with 32 GB of Flash storage. The Deluxe package additionally includes stands for the console and for the GamePad, a charging dock for the GamePad, and the pack-in game Nintendo Land. An HDMI cable is included with both versions. The Wii U's primary controller is the Wii U GamePad, which features an embedded touchscreen. The touchscreen is used to supplement the main gameplay shown on the television or, with games supporting Off TV Play, can allow the player to continue playing games by displaying the main gameplay even when the television is off. In addition to the Wii U GamePad, a more traditional controller, called the Wii U Pro Controller, may be used. The system is backward compatible with Wii, and Wii U games may support compatibility with Wii peripherals, such as the Wii Remote Plus and the Nunchuk. Source: Wikipedia, "Wii U", available under the CC-BY-SA License.